Accepting applications from post-doctoral fellows and graduate students. The aging microenvironment is characterized by increased levels of circulating and tissue associated cytokines, broadly called “age-associated inflammation”. Very little is known about how this age-associated inflammation affects monocytes/macrophages but it appears as though there are changes that affect the very genesis of these cells and contribute to altered function with age and ultimately susceptibility to infections such as pneumonia. By performing in vitro and in vivo studies we are uncovering mechanisms by which macrophages from aged hosts are impaired. Because macrophages are involved in both infectious disease as well as homeostasis (e.g. tissue repair), we predict that understanding how macrophage function changes with age will have broad importance in both studies of infectious disease and chronic diseases that occur more frequently with age. Ultimately a better understanding of age-related changes in the immune response (immunosenescence) is essential to prevent infections such as pneumonia. Using an aged mouse model of Streptococcus pneumoniae colonization and infection to uncover fundamental changes in the immune system that predispose to infection. Understanding how aging changes the genesis of myeloid cells and how this contributes to chronic inflammation and immune dysfunction. Investigating how elevated levels of inflammation contribute to changes in myeloid cell phenotype and function with age. Loukov D, Karampatos S, Maly MR, Bowdish DME. Monocyte activation is elevated in women with knee-osteoarthritis and associated with inflammation, BMI and pain. Osteoarthritis Cartilage. 2017 Nov 8. pii: S1063-4584(17)31300-6. doi: 10.1016/j.joca.2017.10.018. Verschoor CP, McEwen LM, Kobor MS, Loeb MB, Bowdish DME. DNA methylation patterns are related to co-morbidity status and circulating C-reactive protein levels in the nursing home elderly. Exp Gerontol. 2017 Oct 12. pii: S0531-5565(17)30513-2. doi: 10.1016/j.exger.2017.10.010. Kline KA, Bowdish DM. Infection in an aging population.Curr Opin Microbiol. 2015 Dec 10;29:63-67. doi: 10.1016/j.mib.2015.11.003. Verschoor CP, Loukov D, Naidoo A, Puchta A, Johnstone J, Millar J, Lelic A, Novakowski KE, Dorrington MG, Loeb M, Bramson JL, Bowdish DM. Circulating TNF and mitochondrial DNA are major determinants of neutrophil phenotype in the advanced-age, frail elderly.Mol Immunol. 2015 May;65(1):148-56. doi: 10.1016/j.molimm.2015.01.015. Bowdish, D.M.E. 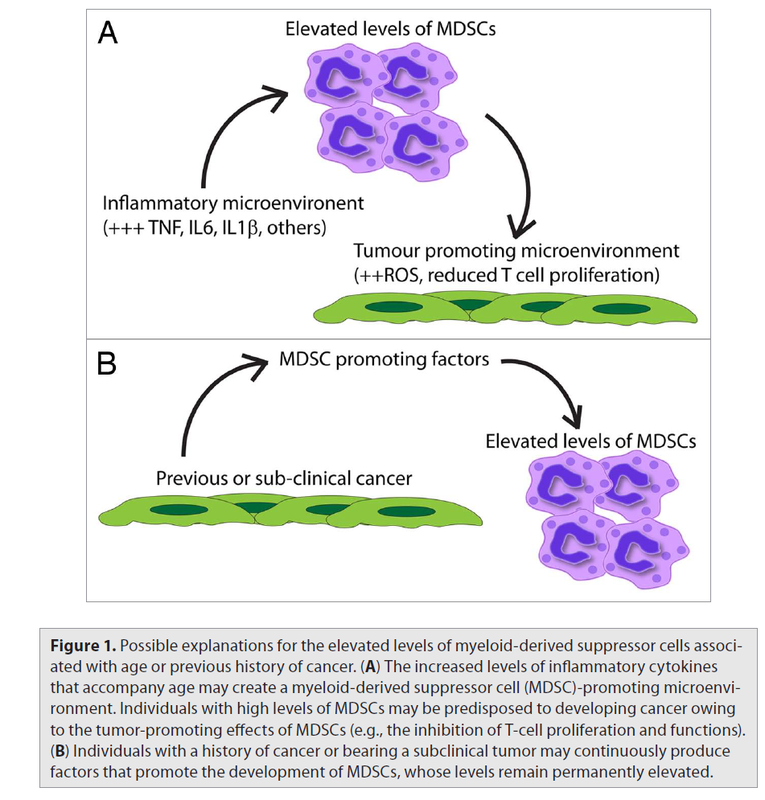 Myeloid-derived suppressor cells, age and cancer. Oncoimmunology. 2:7, e24754; July 2013. Open access figure available for download. Dorrington, M.G., Bowdish, D.M.E. Immunosenescence and novel vaccination strategies for the elderly. 2013. Frontiers in Immunology.doi: 10.3389/ﬁmmu.2013.00171 Media coverage: This paper was picked up by MDLinx. See their coverage here. Verschoor, C.P., Johnstone, J., Dorrington, M.G. Millar, J., Habibagahi, M., Lelic, A., Loeb, M., Bramson, JL., Bowdish, DME. Blood CD33(+)HLA-DR(-) myeloid-derived suppressor cells are increased with age, frailty and a previous history of cancer. 2013 J Leukoc Biol. 2013 Apr;93(4):633-7. doi: 10.1189/jlb.0912461. For supplementary data click here. Publication: Infection in an aging population. Curr Opin Microbiol. 2015 Dec 10;29:63-67.